The Squacco Heron (Ardeola ralloides) is a small heron, 44–47 centimetres (17–19 in) long, of which the body is 20–23 centimetres (7.9–9.1 in), with 80–92 centimetres (31–36 in) wingspan. It is of Old World origins, breeding in southern Europe and the Greater Middle East. The squacco heron is a migrant, wintering in Africa. It is rare north of its breeding range. This is a stocky species with a short neck, short thick bill and buff-brown back. In summer, adults have long neck feathers. Its appearance is transformed in flight, when it looks very white due to the colour of the wings. 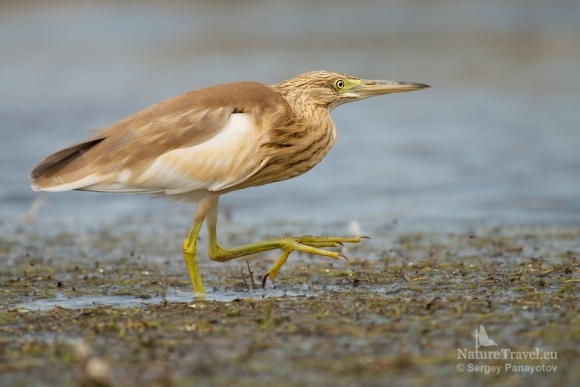 The squacco heron's breeding habitat is marshy wetlands in warm countries. The birds nest in small colonies, often with other wading birds, usually on platforms of sticks in trees or shrubs. 3-4 eggs are laid. They feed on fish, frogs and insects. The English common name Squacco comes via Francis Willughby (circa 1672) quoting a local Italian name Sguacco. The current spelling comes John Hill in 1752. The scientific name comes from Latin ardeola, little heron, and ralloides, Latin rallus, a rail and Greek -oides, resembling.